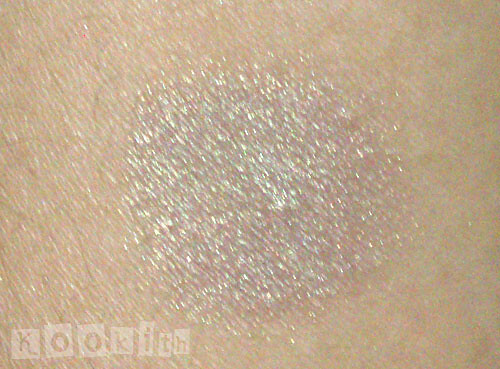 An iridescent smokey lavender mineral eyeshadow. Whimsy is an interesting color…It’s an iridescent smokey lavender, but in certain lights you see flashes of gold and green. This is one of my favorite one color washes paired with a great liner and you are ready to go. You can use lip approved shades as lip gloss that are incredibly long wearing, as well as beautiful. You can also dip a clear finger nail wand into the minerals and use as fingernail polish. 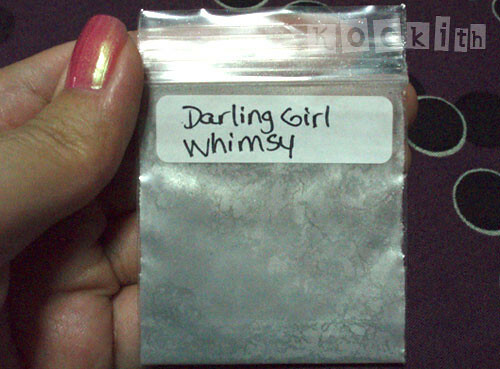 Another gorgeous duochrome eyeshadow from DG, Whimsy is a really complex shade. Depending on the light and angle, the eyeshadow changes from lavender, to gold, to green. I could have sworn I saw some blue, teal and pink shimmer too. 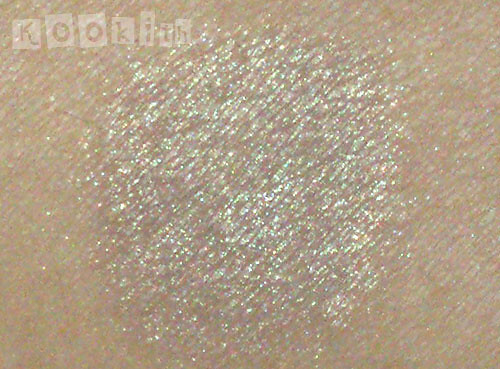 I think this was one of Susan’s earlier products, as the swatch photos are really tiny and hard to see, unlike her recent crystal clear swatches. 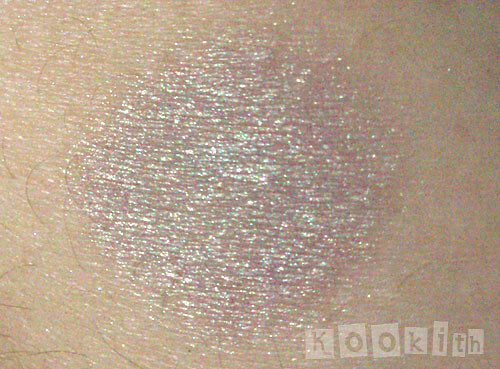 Now here’s the part that left me confused – The official description is smokey lavender, yet the colour from outside the ziplock baggie did not look like the description; my arm swatch looked nothing like the DG swatch on the site. I’m not sure if my skin tone had affected the colour (it shouldn’t though), but to me, Whimsy looked more like a plummy taupe with a little bit of grey in it. I’m not sure why there was such a big discrepancy in the swatches/colour, or if the colour I had gotten was indeed Whimsy. Nevertheless, it’s a really pretty shade and the duochrome effect is pretty awesome. Hey K, is the shade you have? http://flic.kr/p/9Avvqj? Funny that you mention the small pic’s from my earlier shades because I am slowly trying to replace the product and swatch pic’s on all the older ones and Whimsy was one of the shades I just photographed. Ooh nice swatches! It’s amazing the difference a good camera makes, isn’t it? Yes, that’s the colour out of the baggie, it’s more plum than lavender, if it makes any sense. It looks really interesting and complex!